Cilantro is great for your circulatory system. This sauce is great with fish, as a snack with chips, as a spread on sandwiches and as part of a salad dressing. 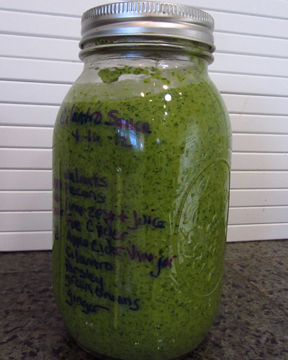 This entry was posted in condiment, foods that boost immunity, Healthy Eating, healthy snack, Home-Made, pesto, Recipes & Guest Posts, sauce and tagged cilantro, condiment, fish sauce, pesto, salad dressing. Bookmark the permalink.